Treasury warrant to the Receipt for tallies on the Hereditary and Temporary Excise for 875l. to George Tollett, esq., in repayment of so much lent by him thereon the 20th inst. Money Book XII, p. 144. Henry Guy to the Auditor of the Receipt to issue 64,000l. to the Treasurer of the Navy: to be issued out of loans to be made by said Treasurer or his deputy on the 400,000l. 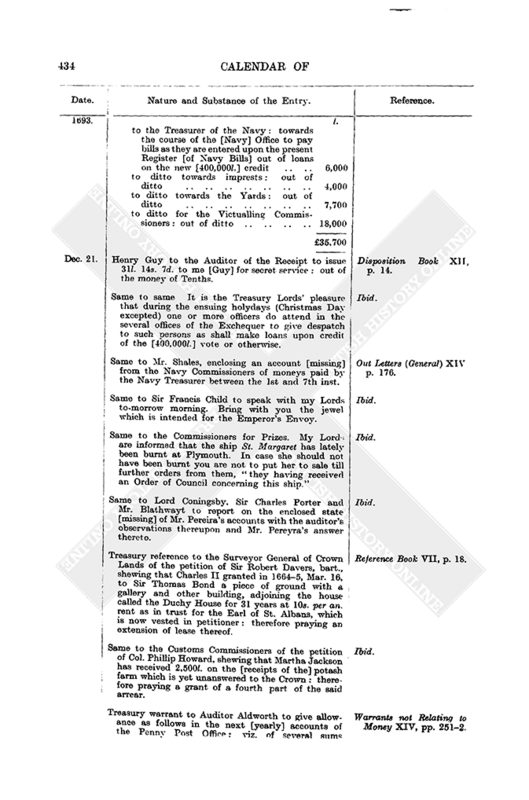 credit voted by the House of Commons: and to be applied to the payment of [Navy] bills in course as they stand entered in the Register kept in the Navy Office. Disposition Book XII, p. 13. Same to same to issue as follows out of the Exchequer, viz. : l. Ibid. Henry Guy to the Auditor of the Receipt to issue 31l. 14s. 7d. to me [Guy] for secret service: out of the money of Tenths. Disposition Book XII, p. 14. Same to same It is the Treasury Lords' pleasure that during the ensuing holydays (Christmas Day excepted) one or more officers do attend in the several offices of the Exchequer to give despatch to such persons as shall make loans upon credit of the [400,000l.] vote or otherwise. Ibid. Same to Mr. Shales, enclosing an account [missing] from the Navy Commissioners of moneys paid by the Navy Treasurer between the 1st and 7th inst. Out Letters (General) XIV p. 176. Same to Sir Francis Child to speak with my Lords to-morrow morning. Bring with you the jewel which is intended for the Emperor's Envoy. Ibid. Same to the Commissioners for Prizes. My Lords are informed that the ship St. Margaret has lately been burnt at Plymouth. In case she should not have been burnt you are not to put her to sale till further orders from them, “they having received an Order of Council concerning this ship.” Ibid. Same to Lord Coningsby, Sir Charles Porter and Mr. Blathwayt to report on the enclosed state [missing] of Mr. Pereira's accounts with the auditor's observations thereupon and Mr. Pereyra's answer thereto. Ibid. Treasury reference to the Surveyor General of Crown Lands of the petition of Sir Robert Davers, bart., shewing that Charles II granted in 1664–5, Mar. 16, to Sir Thomas Bond a piece of ground with a gallery and other building, adjoining the house called the Duchy House for 31 years at 10s. per an. rent as in trust for the Earl of St. Albans, which is now vested in petitioner: therefore praying an extension of lease thereof. Reference Book VII, p. 18. Same to the Customs Commissioners of the petition of Col. Phillip Howard, shewing that Martha Jackson has received 2,500l. on the [receipts of the] potash farm which is yet unanswered to the Crown: therefore praying a grant of a fourth part of the said arrear. Ibid. 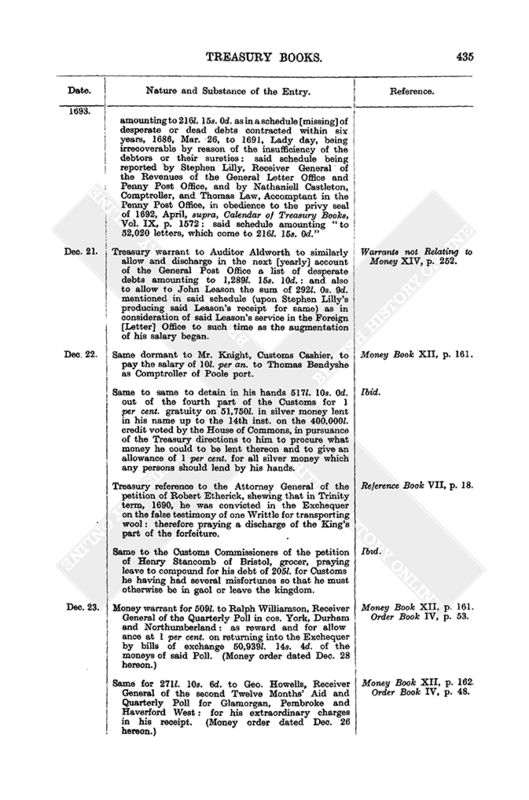 Treasury warrant to Auditor Aldworth to give allowance as follows in the next [yearly] accounts of the Penny Post Office: viz. of several sums amounting to 216l. 15s. 0d. as in a schedule [missing] of desperate or dead debts contracted within six years, 1686, Mar. 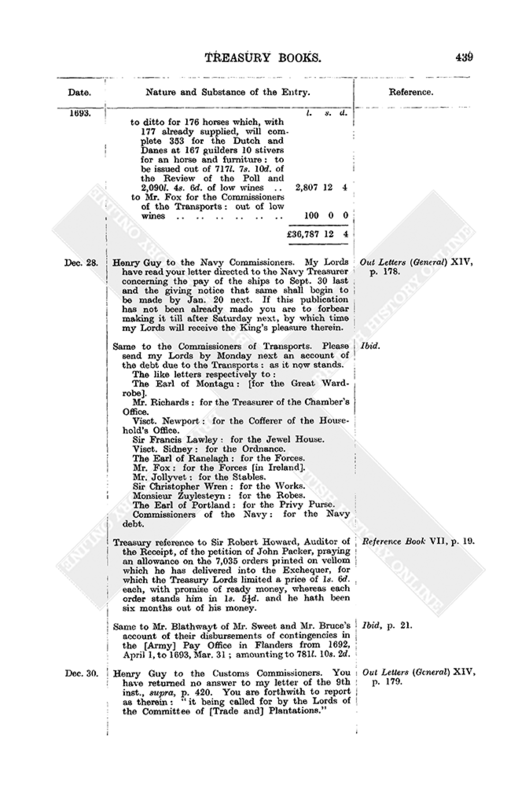 26, to 1691, Lady day, being irrecoverable by reason of the insufficiency of the debtors or their sureties: said schedule being reported by Stephen Lilly, Receiver General of the Revenues of the General Letter Office and Penny Post Office, and by Nathaniell Castleton, Comptroller, and Thomas Law, Accomptant in the Penny Post Office, in obedience to the privy seal of 1692, April, supra, Calendar of Treasury Books, Vol. IX, p. 1572: said schedule amounting “to 52,020 letters, which come to 216l. 15s. 0d.” Warrants not Relating to Money XIV, pp. 251–2. Treasury warrant to Auditor Aldworth to similarly allow and discharge in the next [yearly] account of the General Post Office a list of desperate debts amounting to 1,289l. 15s. 10d. : and also to allow to John Leason the sum of 292l. 0s. 9d. 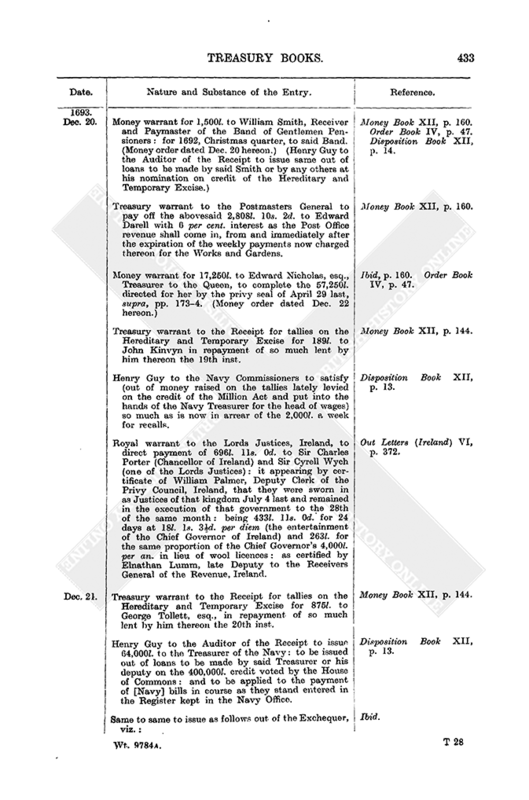 mentioned in said schedule (upon Stephen Lilly's producing said Leason's receipt for same) as in consideration of said Leason's service in the Foreign [Letter] Office to such time as the augmentation of his salary began. Warrants not Relating to Money XIV, p. 252. Same dormant to Mr. Knight, Customs Cashier, to pay the salary of 10l. per an. to Thomas Bendyshe as Comptroller of Poole port. Money Book XII, p. 161. Same to same to detain in his hands 517l. 10s. 0d. out of the fourth part of the Customs for 1 per cent. gratuity on 51,750l. in silver money lent in his name up to the 14th inst. on the 400,000l. 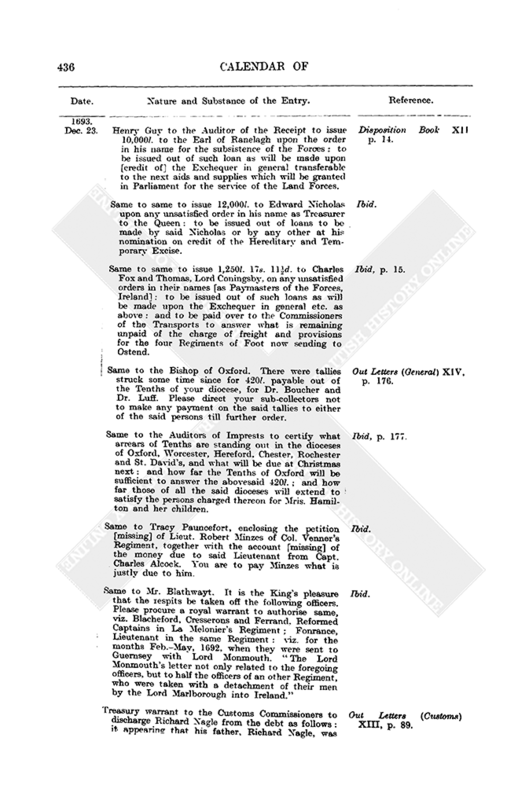 credit voted by the House of Commons, in pursuance of the Treasury directions to him to procure what money he could to be lent thereon and to give an allowance of 1 per cent, for all silver money which any persons should lend by his hands. Ibid. Treasury reference to the Attorney General of the petition of Robert Etherick, shewing that in Trinity term, 1690, he was convicted in the Exchequer on the false testimony of one Writtle for transporting wool: therefore praying a discharge of the King's part of the forfeiture. Reference Book VII, p. 18. Same to the Customs Commissioners of the petition of Henry Stancomb of Bristol, grocer, praying leave to compound for his debt of 205l. for Customs he having had several misfortunes so that he must otherwise be in gaol or leave the kingdom. Ibid. Money warrant for 509l. to Ralph Williamson, Receiver General of the Quarterly Poll in cos. York, Durham and Northumberland: as reward and for allow ance at 1 per cent. on returning into the Exchequer by bills of exchange 50,939l. 14s. 4d. of the moneys of said Poll. (Money order dated Dec. 28 hereon.) Money Book XII, p. 161. Order Book IV, p. 53. Same for 271l. 10s. 6d. to Geo. Howells, Receiver General of the second Twelve Months' Aid and Quarterly Poll for Glamorgan, Pembroke and Haverford West: for his extraordinary charges in his receipt. (Money order dated Dec. 26 hereon.) Money Book XII, p. 162. Order Book IV, p. 48. Henry Guy to the Auditor of the Receipt to issue 10,000l. to the Earl of Ranelagh upon the order in his name for the subsistence of the Forces: to be issued out of such loan as will be made upon [credit of] the Exchequer in general transferable to the next aids and supplies which will be granted in Parliament for the service of the Land Forces. Disposition Book XII, p. 14. Same to same to issue 12,000l. to Edward Nicholas upon any unsatisfied order in his name as Treasurer to the Queen: to be issued out of loans to be made by said Nicholas or by any other at his nomination on credit of the Hereditary and Temporary Excise. Ibid. Same to same to issue 1,250l. 17s. 11½d. to Charles Fox and Thomas, Lord Coningsby, on any unsatisfied orders in their names [as Paymasters of the Forces, Ireland]: to be issued out of such loans as will be made upon the Exchequer in general etc. as above: and to be paid over to the Commissioners of the Transports to answer what is remaining unpaid of the charge of freight and provisions for the four Regiments of Foot now sending to Ostend. Ibid, p. 15. Same to the Bishop of Oxford. There were tallies struck some time since for 420l. payable out of the Tenths of your diocese, for Dr. Boucher and Dr. Luff. Please direct your sub-collectors not to make any payment on the said tallies to either of the said persons till further order. Out Letters (General) XIV, p. 176. Same to the Auditors of Imprests to certify what arrears of Tenths are standing out in the dioceses of Oxford, Worcester, Hereford, Chester, Rochester and St. David's, and what will be due at Christmas next: and how far the Tenths of Oxford will be sufficient to answer the abovesaid 420l. ; and how far those of all the said dioceses will extend to satisfy the persons charged thereon for Mris. Hamilton and her children. Ibid, p. 177. Same to Tracy Pauncefort, enclosing the petition [missing] of Lieut. Robert Minzes of Col. Venner's Regiment, together with the account [missing] of the money due to said Lieutenant from Capt. Charles Alcock. You are to pay Minzes what is justly due to him. Ibid. Same to Mr. Blathwayt. It is the King's pleasure that the respits be taken off the following officers. Please procure a royal warrant to authorise same, viz. Blacheford, Cresserons and Ferrand, Reformed Captains in La Melonier's Regiment; Fonrance, Lieutenant in the same Regiment: viz. for the months Feb.-May, 1692, when they were sent to Guernsey with Lord Monmouth. “The Lord Monmouth's letter not only related to the foregoing officers, but to half the officers of an other Regiment, who were taken with a detachment of their men by the Lord Marlborough into Ireland.” Ibid. Treasury warrant to the Customs Commissioners to discharge Richard Nagle from the debt as follows: it appearing that his father, Richard Nagle, was for some years a very faithful collector of Customs in Barbados (Receiver of the Four and a Half per cent. Duty at Holetown, Barbados) till within three years past, when he died, leaving 40l. of effects in England and three sons and one daughter who jointly administered; but having great losses at sea by means of the French said collector stands indebted 50l. to the King, which his children, having consumed their portions, are in no condition to pay, the son Richard being a soldier in Col. Coy's Regiment with a wife and two small children and his two brothers being volunteers in their Majesties' service. Out Letters (Customs) XIII, p. 89. Treasury warrant to the Clerk of the Pipe for a lease to John Squibb of a house at Charing Cross adjoining the Mews and [to] the house of Mr. Aubery, ut supra, pp. 334–5, and Calendar of Treasury Books, Vol. IX, p. 1686: for 48 years from 1706, Dec. 3, at the ancient rent of 10s. and fine of 90l. (Undated entry [about July, 1694] of the Treasury Lords' signature of the docquet of this lease.) Warrants not Relating to Money XIV, pp. 253, 318. Same to same for a same to George Stillingfleet, gent., of the premises (the manor of Portland), ut supra, p. 431, for 31 years at 10l. per an. rent and fine of 500l. (Undated entry [about 1693–4, Jan. 24] of the Treasury Lords' signature of the docquet of this lease). Ibid, pp. 253, 260. The Treasury Lords to the Lords Justices, Ireland. 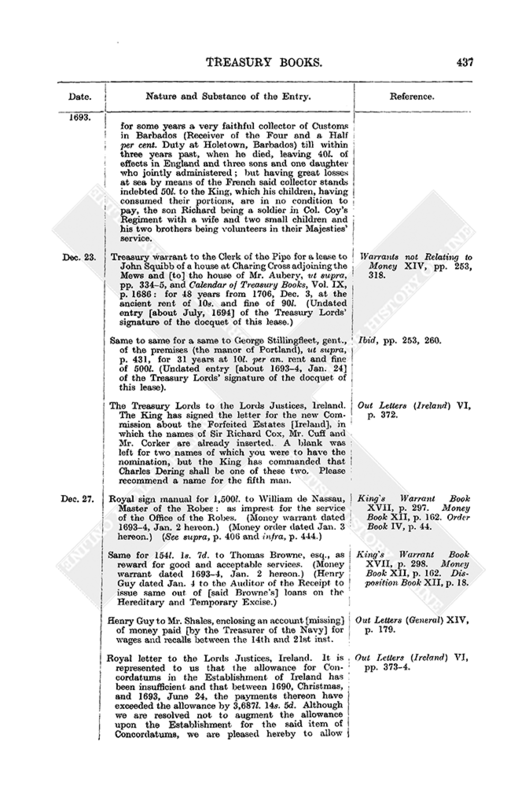 The King has signed the letter for the new Commission about the Forfeited Estates [Ireland], in which the names of Sir Richard Cox, Mr. Cuff and Mr. Corker are already inserted. A blank was left for two names of which you were to have the nomination, but the King has commanded that Charles Dering shall be one of these two. Please recommend a name for the fifth man. Out Letters (Ireland) VI, p. 372. Royal sign manual for 1,500l. to William de Nassau, Master of the Robeg: as imprest for the service of the Office of the Robes. (Money warrant dated 1693–4, Jan. 2 hereon.) (Money order dated Jan. 3 hereon.) (See supra, p. 406 and infra, p. 444.) King's Warrant Book, XVII, p. 297. Money Book XII, p. 162. Order Book IV, p. 44. Same for 154l. 1s. 7d. to Thomas Browne, esq., as reward for good and acceptable services. (Money warrant dated 1693–4, Jan. 2 hereon.) (Henry Guy dated Jan. 4 to the Auditor of the Receipt to issue same out of [said Browne's] loans on the Hereditary and Temporary Excise.) King's Warrant Book XVII, p. 298. Money Book XII, p. 162. Disposition Book XII, p. 18. 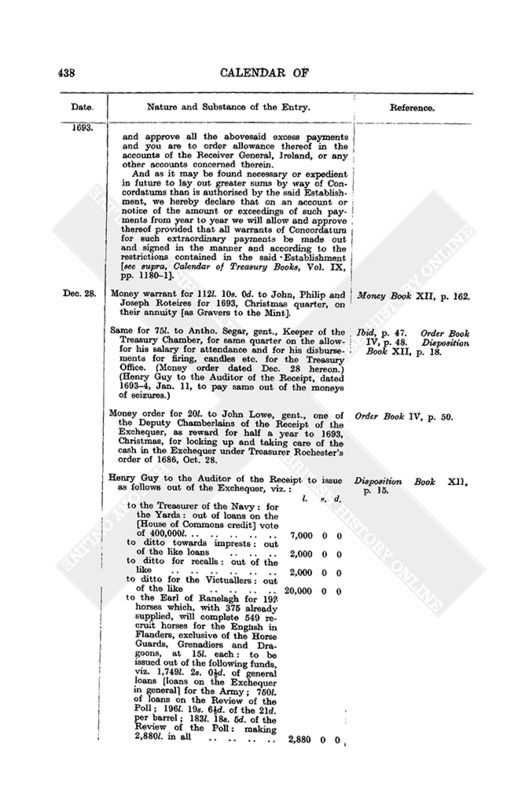 Henry Guy to Mr. Shales, enclosing an account [missing] of money paid [by the Treasurer of the Navy] for wages and recalls between the 14th and 21st inst. Out Letters (General) XIV, p. 179. Royal letter to the Lords Justices, Ireland. It is represented to us that the allowance for Concordatums in the Establishment of Ireland has been insufficient and that between 1690, Christmas, and 1693, June 24, the payments thereon have exceeded the allowance by 3,687l. 14s. 5d. Although we are resolved not to augment the allowance upon the Establishment for the said item of Concordatums, we are pleased hereby to allow and approve all the abovesaid excess payments and you are to order allowance thereof in the accounts of the Receiver General, Ireland, or any other accounts concerned therein. Out Letters (Ireland) VI, pp. 373–4. And as it may be found necessary or expedient in future to lay out greater sums by way of Concordatums than is authorised by the said Establishment, we hereby declare that on an account or notice of the amount or exceedings of such payments from year to year we will allow and approve thereof provided that all warrants of Concordatum for such extraordinary payments be made out and signed in the manner and according to the restrictions contained in the said Establishment [see supra, Calendar of Treasury Books, Vol. IX, pp. 1180–1]. Money warrant for 112l. 10s. 0d. to John, Philip and Joseph Roteires for 1693, Christmas quarter, on their annuity [as Gravers to the Mint]. Money Book XII, p. 162. Same for 75l. to Antho. Segar, gent., Keeper of the Treasury Chamber, for same quarter on the allow for his salary for attendance and for his disbursements for firing, candles etc. for the Treasury Office. (Money order dated Dec. 28 hereon.) (Henry Guy to the Auditor of the Receipt, dated 1693–4, Jan. 11, to pay same out of the moneys of seizures.) Ibid, p. 47. Order Book IV, p. 48. Disposition Book XII, p. 18. Money order for 20l. to John Lowe, gent., one of the Deputy Chamberlains of the Receipt of the Exchequer, as reward for half a year to 1693, Christmas, for locking up and taking care of the cash in the Exchequer under Treasurer Rochester's order of 1686, Oct. 28. Order Book IV, p. 50. Henry Guy to the Auditor of the Receipt to issue as follows out of the Exchequer, viz. : l. s. d. Disposition Book XII, p. 15. Henry Guy to the Navy Commissioners. My Lords have read your letter directed to the Navy Treasurer concerning the pay of the ships to Sept. 30 last and the giving notice that same shall begin to be made by Jan. 20 next. If this publication has not been already made you are to forbear making it till after Saturday next, by which time my Lords will receive the King's pleasure therein. Out Letters (General) XIV, p. 178. Same to the Commissioners of Transports. Please send my Lords by Monday next an account of the debt due to the Transports: as it now stands. Ibid. The Earl of Montagu: [for the Great Wardrobe]. Mr. Richards: for the Treasurer of the Chamber's Office. Visct. Newport: for the Cofferer of the Household's Office. Sir Francis Lawley: for the Jewel House. Visct. Sidney: for the Ordnance. The Earl of Ranelagh: for the Forces. Mr. Fox: for the Forces [in Ireland]. Mr. Jollyvet: for the Stables. Sir Christopher Wren: for the Works. Monsieur Zuylesteyn: for the Robes. The Earl of Portland: for the Privy Purse. Commissioners of the Navy: for the Navy debt. Treasury reference to Sir Robert Howard, Auditor of the Receipt, of the petition of John Packer, praying an allowance on the 7,035 orders printed on vellom which he has delivered into the Exchequer, for which the Treasury Lords limited a price of 1s. 6d. each, with promise of ready money, whereas each order stands him in 1s. 5½d. and he hath been six months out of his money. Reference Book VII, p. 19. Same to Mr. Blathwayt of Mr. Sweet and Mr. Bruce's account of their disbursements of contingencies in the [Army] Pay Office in Flanders from 1692, April 1, to 1693, Mar. 31; amounting to 781l. 10s. 2d. Ibid, p. 21. Henry Guy to the Customs Commissioners. You have returned no answer to my letter of the 9th inst., supra, p. 420. You are forthwith to report as therein: “it being called for by the Lords of the Committee of [Trade and] Plantations.” Out Letters (General) XIV, p. 179.